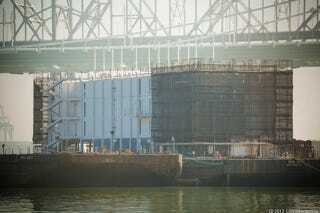 What the Hell Is Google Building On This Massive Barge? Cnet reports that Google is building something super secret—and super huge—on a barge that's floating in the San Francisco Bay. What the hell is this thing? According to Cnet, the structure stands four stories tall and is floating on a large barge in the San Francisco Bay, just off shore from Treasure Island. It's made out of a series of shipping containers. Cnet speculates that inside these containers, Google is building a prototype for a floating data center—which makes a lot of sense, because using sea water to cool data centers could potentially save the company a bucket of money.